There’s more than a dozen ways to brew a good cup of coffee. And no matter the roast or the strength, coffee maker manufacturer Hamilton Beach has a machine for the java novice and aficionado alike. 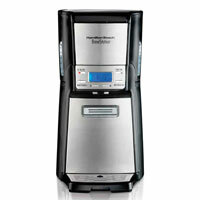 Some machines use single-serving pods, such as the Hamilton Beach 49970 Personal Cup. 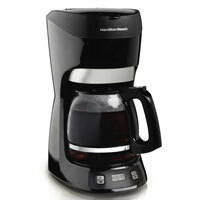 Others, such as the Hamilton Beach 49467 12 Cup with Digital Clock, use a traditional filter and coffee grounds. Another 12-cup and Summit models get rid of a coffee pot all together and use an insulated tank to keep coffee hot and fresh. Newer models, such as the 2-Way or FlexBrew, encompass all methods and can use both pods and grounds to meet your coffee needs. Read through our list of Hamilton Beach’s best brewers to help you decide if one is right for you. NerdWallet Shopping’s scoring of the best Hamilton Beach coffee makers is based on our analysis of the opinions of experts and shoppers like you. Whether you prefer decaf or regular, single-serve or 12-cup, you need a coffee maker that will brew a cup of joe to your liking. That’s where we come in. 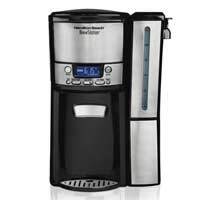 We analyzed the most popular coffee makers on the market, including Hamilton Beach’s, to help you purchase the right one. We recognize that consumers look for different qualities in coffee makers, so we scored users’ observations on multiple features of top models, including ease of use, coffee quality and more. Ease of use: This score indicates reviewers’ satisfaction with how easy the maker is to use. This includes aspects such as cleaning, setup, design and features. Ease of use is a contributor to each coffee maker’s overall score, but we also highlighted it separately because many consumers seek an easy-to-use machine. 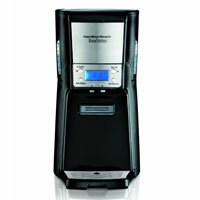 Here are our top Hamilton Beach coffee makers, ranked in order of overall score. Easy to brew and easy to clean, the Personal Cup is a single-serving coffee maker. Users just pop in a pod, pour water in and push a button to operate. Using pods gives coffee drinkers an array of flavors to choose from. Coffee aficionados who prefer a stronger brew, however, thought the coffee lacked the caffeine kick they crave. Quick brewing doesn’t make coffee bold enough. Coffee is too weak and not hot enough. 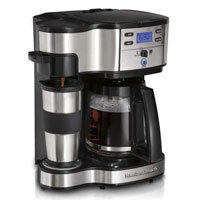 The digital, stainless steel model brews a full 12-cup pot of coffee and looks good while doing it. Users admire the clean, compact design that takes up minimal counter space. The carafe lid, however, can be difficult to clean. Display is easy to use, read and program. Wheels at the base of the machine make water reservoir easy to fill. Good for coffee drinkers on the go, the Summit Ultra dispenses the brew at the touch of a button, and the dispense tray can hold tall tumblers. The insulated tank keeps the coffee tasting warm and fresh, but can be tough to clean due to the Ultra’s bulky design. Users complained the coffee maker took up too much room and couldn’t fit under low cabinets. No-pour dispenser bar prevents spilling. 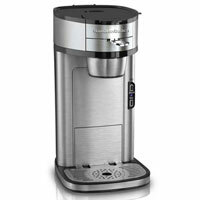 The Hamilton Beach 49981A Single-Serve — better known as The Scoop Single-Serve — is a simple coffee maker with multiple brewing options to make your coffee customizable. Users especially like how quickly it can churn out a strong, hot cup. Brews strong, hot coffee quickly. Coffee tends to spill over. No indicator to show how much water is in the reservoir. 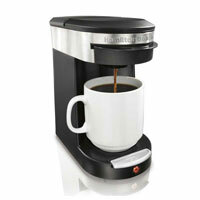 The Hamilton Beach 2-Way lets users brew coffee for one or 12, with grounds or pods. No matter what you choose, the 2-Way produces a nice cup of coffee, though users mentioned it takes a little longer to produce that perfect batch. Bulky, too tall for low cabinets. 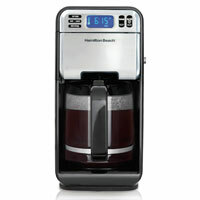 The Hamilton Beach 12 Cup Coffee Maker With Digital Clock is a simple brewer. This machine uses a cone filter, which helps it brew consistently delicious java and is easy to clean. Eager coffee drinkers appreciated the “pause and serve” feature that lets users pour a cup mid-brew. The time saved was spent cleaning, however, because the carafe tends to spill unless poured slowly. No option to make coffee stronger. A carafe-less coffee maker, the Summit has an insulated tank where it brews 12 cups of coffee to dispense in single servings. Users liked features such as the removable water reservoir for easy filling and the auto shut-off on the keep-warm timer. Hamilton’s original 12-cup coffee dispenser is its first to go carafe-less. It uses a dispenser bar instead, and removing the coffee pot means no more pouring, spilling, breaking or tasting burnt java. Coffee can taste watery; needs double amount of grounds. Water tends to leak or overflow. Just as the name implies, this two-dispenser coffee system gives users plenty of options to meet their coffee fix. It can brew one cup or 12, and can make coffee with pods or grounds. Users liked the brewing flexibility but said that K-cups would impart a plastic-like smell and taste to the coffee. Can fit in small counter spaces. Option to brew single cup or 12 cups. K-cup pods leave plastic-like taste in coffee.